Suitable for use in any dynamics experiment, this photogate module includes an aluminum attachment bracket, mounting rod, and cord. It is also compatible with other timing systems using a 1/4" stereo TTL input. This system features a self-contained LED light source and a well-shielded silicon photodiode as a detector. The electronics are housed in an impact resistant ABS plastic module which contains 3 orthogonal mounting points for attachment of the included ringstand bar. With a 1/4-20 thumbscrew, direct attachment to various apparatus is also possible. A Computer Timing Interface is designed to be controlled by up to two Photogate Modules or other logic level switches. While it is particularly well-suited to measuring and recording events with one or two gliders on Daedalon air tracks, virtually any experiment in mechanics will benefit from it robustness and ease of use. The Timer interface program, designed to run with Windows operating systems, displays and exports a simple tab-delimited log of rising- and falling-edge events. It also runs in pendulum period mode. The interface is machined from tough, impact-resistant ABS and is powered from the computer’s USB port so that no external power is required. Indicator LEDs allow visual monitoring of the state of each connected gate as well as computer connectivity.For convenience, the interface can be operated from a laptop. Includes one ET-45 Photogate Module, cord, and Timer software. 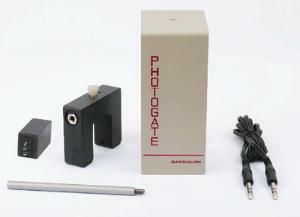 A Photogate Adapter allows you to use an older photogates with new Daedalon timers.